Mumbai: A report released by a London-based art market research and analysis firm on Friday confirmed a whisper that’s been floating in the art market here for several months now: that the Indian modern art market has weakened. 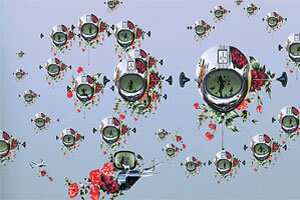 Young Turks: Thukral & Tagra’s Somnium Genero-Turbo, a triptych, sold for more than $463,000 (about Rs 1.8 crore) at the Christie’s Asian contemporary art sale in Hong Kong on Sunday. According to findings of ArtTactic’s Market Confidence Survey, while there’s been a significant increase in prices for contemporary art, the modern Indian art market has been falling since early this year. “In its day, the modern market had a colossal rise. And even though the interest and confidence in some of the modern masters remains, these findings reflect a larger general interest in the contemporary art market at present," says Anders Petterson, managing director of ArtTactic. More than anything else, this is an indication of the coming of age of the contemporary art market here. Since the early 2000s, the modern masters helped create many milestones Indian art came to be known by. According to the ArtTactic report, the confidence indicator in the contemporary art market stands 32% higher than the confidence indicator in the modern Indian art market. What this means is that market confidence in masters like Akbar Padamsee, Himmat Shah, Ram Kumar, and Jogen Chowdhury has seen a sharp downturn since early this year. Artists who have bucked the trend include the ever-popular M.F. Husain, S.H. Raza and Zarina Hashmi. Names like Tyeb Mehta and S.H. Raza were the first to cross the Rs1 crore mark in the international market in the early 2000s. And during that time, most auction houses clubbed modern and contemporary art together because most felt that the contemporaries couldn’t stand on their own. That’s changed now. “The contemporary art market has been growing at a frenetic pace, going to international markets through art fairs and biennials, while the moderns are looked at by a different group of people all together like museums," says Dinesh Vazirani, head of Mumbai’s Saffronart, which was the first auction house to spin off contemporary and modern works into separate auctions in 2005. And even though auction prices are perhaps not the best indicator of price points, for a sense of the growth spurt in Indian contemporary art, survey the sale prices at the Christie’s Asian contemporary art sale in Hong Kong this past weekend. Works by artists such as Thukral & Tagra, Subodh Gupta, N.S. Harsha and T.V. Santhosh all sold for close to half a million US dollars and, along the way, their works broke world auction records. These prices also reflect the globalization of Indian art: Indian contemporary art is bought by international buyers, while the audience for modern art is made up of only Indian and NRI (non-resident Indian) buyers. “There’s a general feeling among international collectors that modern Indian art of the 1950s is derivative of other styles prevalent in that time, and it’s not seen as startlingly original work," says Mortimer Chatterjee of C&L gallery in Mumbai. So, is this a good time to buy that Jogen canvas? Experts say that the tide will turn soon. “There’s momentum in both," says Vazirani. “I would be surprised if we didn’t see a surge in interest in the moderns. Many buyers got into the contemporary market because they couldn’t afford a modern, but now that they’ve reached interesting price levels, there’s bound to more people willing to buy." Saffronart will walk the talk when it conducts its annual modern sale during the first week of December. The contemporary market is also not risk-free. According to ArtTactic, there’s large-scale speculation by investors and market manipulation by dealers in the contemporary sector. It’s a scene that could potentially put off buyers. “International collectors come with baggage. They want to know where an artist has been, what museums have taken his work, to justify prices. If they feel that a market is over-valued and artists don’t have the body of work to show for it then they might feel that Indian artists are too expensive and be put off," says Petterson. ArtTactic’s Market Confidence Survey for November is part of the agency’s six-monthly analysis of the Indian art market and only its second look at this market. When ArtTactic conducted its first survey of the Indian art market in May, it clubbed the modern and contemporary markets together. For the survey, the firm interviewed 84 people related to the Indian art market, including collectors and gallery owners, who were perceived as influential in the region. No artists were included in the sample. The firm has been conducting similar surveys of the Western art market since 2005.